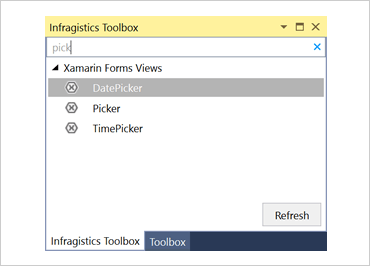 The first NuGet-powered toolbox, the Xamarin.Forms Toolbox includes all the Xamarin controls by Infragistics, as well as the Xamarin controls native to the platform for quick access to design your page – automatically adding the namespace and XAML for your selected control. Watch our how-to videos to explore the full capabilities of Xamarin Toolbox. 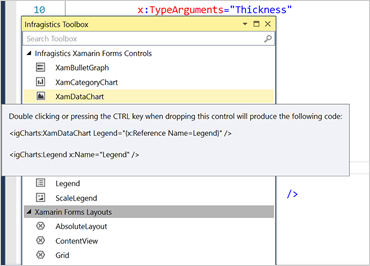 Easily drag toolbox items directly onto the XAML editor delivering a WYSIWYG XAML view of the control to design entire page views with no XAML editing required. 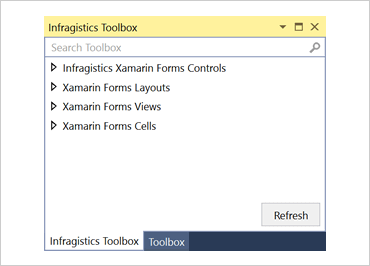 The Xamarin.Forms Toolbox conveniently includes Infragistics controls and Xamarin native controls – grouped by Infragistics controls and Xamarin controls, which are further grouped by Layouts, Views, and Cells, just like the Xamarin documentation. Save time by using Ctrl+Drag on toolbox widgets, adding developer-friendly extended XAML features – like embedding a ScrollViewer inside of a StackPanel, or adding additional binding information for a Pie Chart – saving you the time of adding this additional XAML yourself! Search gives you a quick and easy way to find a control or component, including partial-word search, just like you get with any standard toolbox window.